LLSAPrep provides emergency medicine physicians and professionals with an online or on-site succinct, didactic review of the Lifelong Learning and Self-Assessment articles for each cycle year. LLSAPrep will strengthen your EM knowledge and prepare you for the LLSA exam. This elegantly designed peer-reviewed course is intended to review, discuss and test immediately! Convenient: We come to your city and offer the lecture, handouts and a testing facility. Efficient: 20 articles are reviewed in approximately 90 minutes, with LLSA testing immediately afterwards. Multiple sessions can be arranged to review more than one cycle year. Fun: Our speakers engage the audience with their unique sense of humor. Successful: Guarantee you will pass the LLSA exam or your money back! 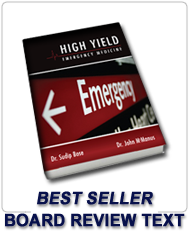 Perfect for hospital and physician groups. You can group together with your colleagues and fellow physicians to request a lecture. We prefer groups of 10 or more for the on-site lectures. Larger groups may qualify for a discount. Check out our tour dates and request your course today! We also take requests for different cities and specific dates.